I am honoured and delighted to have been nominated for the Ancestor Approved Award by both Kerrie Farmer and Judy Webster. The Award was created by Leslie Ann Ballou to acknowledge genealogy blogs that are ‘full of tips and tricks as well as funny and heartwarming stories’. Recipients are asked to list ten surprising, humbling or enlightening aspects of their research, and to pass on the award to ten other researchers. Here are my lists. 1. 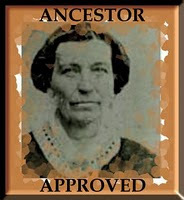 Given that I first started doing my family history in 1977 I am surprised that I am still doing it in 2011! 3. I also have discovered many long lost family members on all of my family lines and it has been fun sharing and exchanging information. 4. My research has also meant that I now know a lot more about the history of Australia, England, Scotland, Ireland, Norway, Canada and the USA. You can’t do genealogy without also looking at the historical times in which our ancestors lived. 5. Genealogy has also taught me how small a world it is – my partner’s family comes from the same village in Staffordshire that my mother’s family comes from – what are the chances of that 150 odd years down the track? 6. None of my families were wealthy or famous but they led interesting lives and I have been fortunate to find them documented in various government records – it’s just lucky I went looking for them in asylums and prisons otherwise I might have missed all the good stuff! 7. Embracing the new social media of Facebook, Twitter, Blogs, Nings and so on has meant even more genealogy friends to share information with and long lost family members are finding me through my website and other media. It is truly a great time for family history. 8. I am humbled that so many people follow me and read my blogs and provide comments and other feedback – often when you are writing, you wonder if anyone ever reads it so thanks to everyone who have encouraged me in this brave new world. 9. I have been fortunate in that for most of my working life, I was able to advance genealogy through my work in various libraries and archives throughout Australia – there aren’t that many people that truly love their work. 10 I have left my favourite aspect to last – Serendipity – where would we be without it? How many of us have found our ancestors in the most unlikely of places? It is why you should look for them everywhere and probably why I still haven’t finished doing my family history yet. Many of my favourite blogs have already received an Ancestor Approved Award so I have tried not to duplicate and to list some lesser known blogs that should be more widely read. I have also kept the list to Australasia. Shauna, I totally agree with your comment about asylum and prison records being ‘the good stuff’. My index to insanity files has stalled due to lack of time, but one of these days I’ll add the last section to my Web site. By the way… I use your unpublished Guide to Prison Records almost every time I am at Qld State Archives. It is starting to come apart at the seams! Thanks Judy – working on a new publication Prisons & Asylums – you will love it! Thank you for the nomination Shauna! Thanks for including us in your list of nominated blogs! Shauna, We met at Unlocking the Past in Brisbane and Recently I heard that you related to the Johnston family. I am descendant from William Waugh & Frances Oxley Thorpe and one of their daughters married a Thomas Danvers Johnston in 1862. Are we researching the same family?